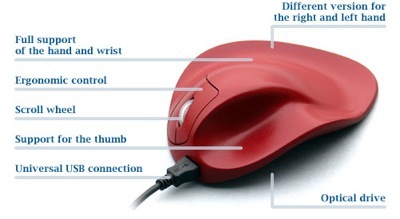 Instead of making your hand fit a mouse, why not have a mouse made to fit your hand? It’s definitely a more logical concept. After all, as much time as some of us spend on the computer, our mouse gets used just as much as our favorite pair of shoes. It only makes sense to measure out your hand and get a sized mouse, much like you’d pick out a set of shoes. This mouse is said to be the ultimate ergonomic mouse, partially because you measure your hands and choose the proper size. It’s a great option for those that have large or tiny hands. The general public is probably just fine finding a comfortable mouse, but if you have big hands you’re eventually going to start cramping from the average mouse. These come in both wired and wireless, which is great for those of you that have a strong preference one way or the other. They come in red, white and black. There are also two version of black, there’s plain black and then there’s black with BlueRay Track. They come in small (up to 170mm), medium (170 – 190mm) and then large (190 – 210mm). Each one will cost you €89 or about $121.